A circular economy is one of the important pillars of a sustainable iron and steel industry. Solid and sludgy residuals from steelmaking processes represent secondary resources with considerable amounts of valuable materials such as metals and minerals. Therefore, several treatment technologies for dusts and sludges target material recovery. The main benefits are a lower demand for primary resources and a reduced landfill volume as well as economic savings for steel plant operators. 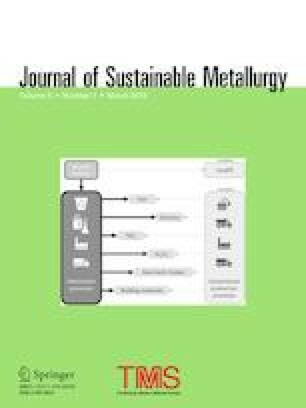 The current review article gives an overview of the amounts of steelmaking residuals generated in Europe and describes the OxyCup® shaft furnace, the integrated DK recycling route, and the Befesa Waelz rolling tube furnace process in detail, which represent currently operating state-of-the-art treatment technologies in detail. Nowadays, European steel producers reach a byproduct recycling rate of up to 95% (including onsite recycling and residual utilization performed by external companies). A benefit analysis was performed by several experts from Germany comparing different residual-treatment processes in terms of feed flexibility, product recovery, and material cycle closure. The study revealed that the OxyCup® shaft furnace and the DK route are more favorable compared to the Befesa Waelz process. However, moderate effort is required to implement the Befesa Waelz process in an existing steelmaking process chain, which is one of the advantages of this technology. The authors gratefully acknowledge the funding support of K1-MET GmbH, the metallurgical competence center. The research program of the K1-MET competence center is supported by COMET (Competence Center for Excellent Technologies), and the Austrian program for competence centers. K1-MET is funded by the Federal Ministry for Transport, Innovation, and Technology; the Federal Ministry for Digital and Economic Affairs; the provinces of Upper Austria, Tyrol, and Styria; as well as the Styrian Business Promotion Agency (SFG).